Bernie Sanders, whose calls for a "political revolution" energized millions of voters across the nation, offered a long-awaited endorsement of his Democratic rival Hillary Clinton on Tuesday, calling for unity just two weeks shy of the Democratic National Convention. 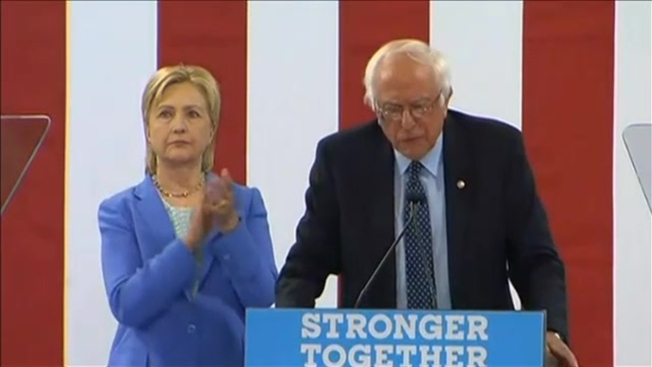 Standing alongside one another at an event in Portsmouth, New Hampshire, Sanders, a self-described democratic socialist, threw his support to Clinton and vowed to do everything in his power help her beat presumptive Republican nominee Donald Trump. "Secretary Clinton has won the Democratic nominating process and I congratulate her for that," Sanders said in New Hampshire on Tuesday. "She will be the Democratic nominee for president and I intend to do everything I can to make certain she will be the next president of the United States." 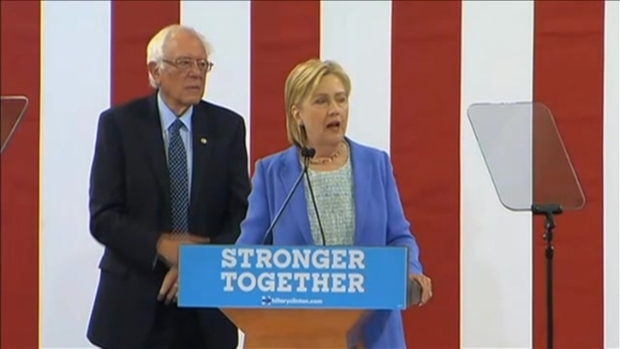 Sanders said Clinton is "far and away the best candidate" to address the needs of the American people and "the very serious crises that we face." He said Clinton is prepared to fight to raise the minimum wage, create jobs, expand access to health care and address climate change. Hillary Clinton laid out the foundation of the Democrat's national platform following former primary rival Bernie Sanders' endorsement in Portsmouth, New Hampshire. The Vermont senator was powered by an impressive online fundraising machine that raised more than $200 million with the help of college students, independents and white voters drawn to his anti-establishment message. His endorsement could help bring some of those supporters into the fold for Clinton as she faces Trump. "Bernie Sanders, who has lost most of his leverage, has totally sold out to Crooked Hillary Clinton," Trump wrote Tuesday as part of a series of tweets. "Sanders was not true to himself and his supporters." "Big talk from the same guy who was too afraid to debate Bernie in California," Sanders' campaign fired back on Twitter. Tuesday's joint event sought to project Democratic unity before Republicans formally nominate Trump next week in Cleveland. Clinton has campaigned with President Barack Obama and Massachusetts Sen. Elizabeth Warren in recent weeks, warning Democrats of the threat of a Trump presidency. 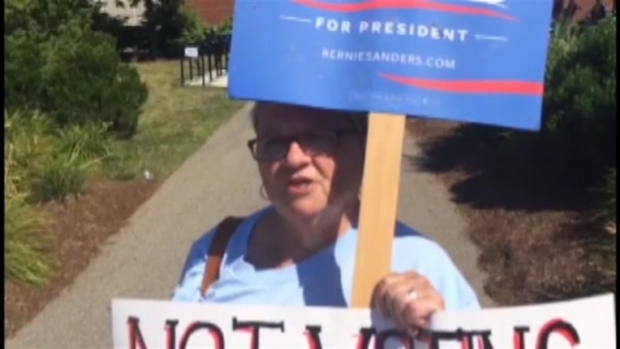 Some Bernie Sanders supporters have their doubts despite their preferred candidate supporting presumptive Democratic nominee Hillary Clinton. She thanked Sanders on Tuesday for his endorsement, saying the Vermont senator has "brought people off the sidelines and into the political process." "Sen. Sanders has brought people off the sidelines and into the political process. He has energized and inspired a generation of young people who care deeply about our country and are building a movement that is bigger than one candidate or one campaign," Clinton said. Clinton last week rolled out proposals on college affordability and access to health care, winning praise from Sanders, and the platform agreed to last weekend in Florida includes many of Sanders' priorities, including a $15 an hour minimum wage. Recent polls have shown that many Sanders voters plan to back Clinton but have reservations about her honesty. Sanders has said he will do all he can to prevent Trump from winning the White House and the senator's vouching for Clinton could help her with the independents, liberals and millennials who flocked to his primary campaign. The Vermont senator saw his longshot bid for the White House quickly catch fire in 2015 at large-scale rallies where he denounced income inequality, the influence of Wall Street and the role of big money in politics. Sanders' unruly white hair and glasses was often depicted in campaign offices and on T-shirts and a campaign catch-phrase, "Feel the Bern," marked his rise online. Comedian Larry David portrayed Sanders on "Saturday Night Live" and the senator made an appearance on the show before the New Hampshire primary. Bernie Sanders, who has lost most of his leverage, has totally sold out to Crooked Hillary Clinton. He will endorse her today - fans angry! I am somewhat surprised that Bernie Sanders was not true to himself and his supporters. They are not happy that he is selling out! Sanders' challenge influenced Clinton's shift to the left on several issues, including her opposition to the proposed Keystone XL pipeline between Canada and the U.S. and her opposition to the Trans-Pacific Partnership Trade Agreement.